Infectious Diseases of Poverty has published an article investigating the risk of malaria on the China-Myanmar border and how this has changed over the years. Jian-wei Xu explains more about the work in this blog. As a malaria control staff member in Yunnan Province of China, I have been working on the China-Myanmar border for 27 years. I’ve heard many stories about malaria, experienced many malaria situations, and joined many intervention activities. 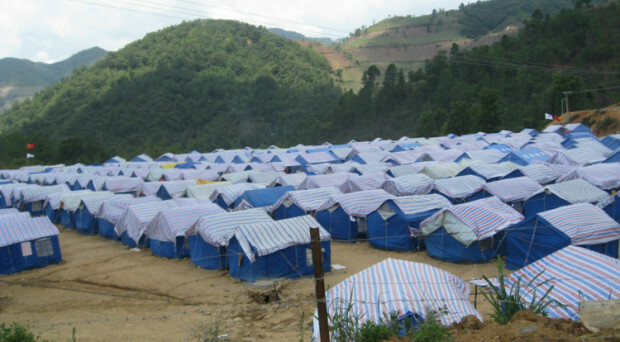 In November 2003, more than 100 deaths occurred in Kokang, Shan Special Region in Myanmar. At the time, local people and the authorities didn’t know the cause of these deaths. Chinese investigators suspected Acute Respiratory Syndrome (SARS) or plague to be the main cause of these deaths. Eventually, experts from Yunnan Institute of Parasitic Diseases (YIPD) confirmed it was malaria. For 13 days, between November 7 and November 19, 1392 new cases of malaria and 125 deaths were detected across 30 villages in Kokang, Myanmar. Intensive efforts with international and domestic financial support to control malaria have dramatically reduced malaria burden on China-Myanmar border over the past decade. Especially with support from the 6th and 10th rounds of GFATM malaria control projects, and cooperation with Myanmar and Health Poverty Action (HPA), malaria control interventions was able to conduct in five special regions of Myanmar from 2007 to 2013. As a result of the interventions of GFATM projects, parasite prevalence rate had decreased from 13.6% in March 2008 to 1.5% in November 2013 in the five special regions of Myanmar. Annual parasite incidence had reduced from 19.6 per 10, 000 person-years in 2006 to 0.9 per 10, 000 person-years in 2013 across 19 Chinese counties. In the Shan Special Region II (locally called Wa State) of Myanmar, our annual indicator survey for evaluation did not detect any malaria parasites in November 2013. On June 19, 2014, HPA reported a P. falciparum malaria outbreak in a private Rubber Plantation, located close to the border. At the time when the outbreak was reported, there were 122 inhabitants, in 24 households of which 14 families were of the Lahu ethnic minority who emigrated from Lancang County, China in 2004. There were ten families of the Wa ethnic minority who emigrated from other villages of the Shan Special region of Myanmar in 2005. We realized that our GFATM projects did not cover the special community when we arrived at the outbreak site. What does our research suggest? Our investigation results show that imported P. falciparum from Salween River Valley caused the outbreak and that children were at higher risk of malaria infection during the outbreak. Seeking inappropriate treatment from a private healer who just administered a single artemether injection for treatment of malaria and lack of protection of bed nets were the causes of the outbreak. The majority of the China-Myanmar border is just a political border where immigration control is only available at those important border crossing points. Illegal immigrants, internally displaced people, refugees and ethnic minorities exist along the mountainous and forested border. However they have limited access to the public health service. Inappropriate diagnoses and treatments with sub-therapeutic-dosage and/or mono-therapies still exist in the private sector along the international border. We cannot deny that inappropriate treatments in the private sector have helped to save lives, however, they contribute to maintain malaria transmission and are thus harmful to patient prognosis, public health and also a cause of drug resistance. In this situation, our malaria control and elimination programs should give special attention to these neglected populations. In order to increase coverage and service of public health facilities, and to strengthen cooperation with private sectors for proper malaria case management, malaria control along China-Myanmar border needs further multilateral collaboration.